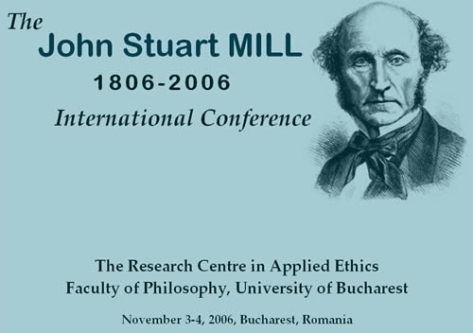 This conference intends to bring together scholars interested in John Stuart Mill's thought in all its aspects: political philosophy, ethics, epistemology, economics, logic etc. Mill's impact on contemporary philosophy will be of great interest to the conference as well as the reception of his writings and ideas in different countries and especially in Romania. The conference will also assess the reasons why Mill's writings are still a valuable subject matter for both undergraduate and graduate courses. Prospective participants are invited to submit a paper in Romanian or English in any of the areas mentioned above until October 1st, 2006. Although there is no registration fee, all prospective participants must register before sending the papers. The registration must contain the academic affiliation and the title of the proposal. Please, use the e-mail given below for any correspondence. The organizers intend to publish a volume including papers from the conference. Acceptance of the paper for the conference does not guarantee the inclusion in the proceedings.